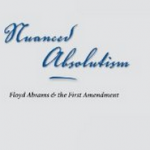 A really fascinating and smart book about Dan’s father, Floyd Abrams, was just released called “Nuanced Absolutism.” It explains, in a sometimes tough but fair way, Floyd’s consistent philosophy on The First Amendment throughout his career, from defending the media to certain vile speech to even corporations. If you care about First Amendment law, you really should read this book by Ronald Collins. It can be purchased here.